Matt's Bike Blog: Ventoux 2009 RIP? Today was the big test for whether I'm ready to tackle the Ventoux stage of the Tour de France in a month's time. I've done 100 miles enough times to know that won't be a huge issue, given enough time to finish. And my weekend cycling on the south coast was reassuring, especially as I was riding my hideously heavy mountain bike with full panniers. But what I haven't been able to prepare adequately for are the hills. But mountains are not so easy to come by where I live, you have to ride a good 30 miles before you hit any proper hills and, even then, we're talking hundreds of feet, not thousands. So I worked out a 100 mile route from Birmingham to Leominster and added in as many hills extra as I could. 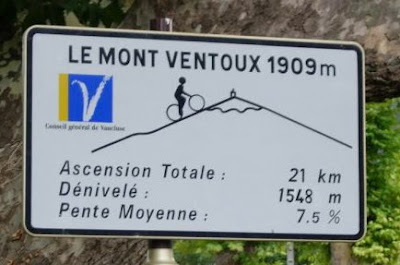 The result is a total climb of about 5,000 feet, which is nearly 40% of the climb on the Ventoux - well it's a start. After faffing around reading the paper I didn't get out onto the road until 10.30 and it took a good 10 miles to get my legs loosened up. The policy today was 'slow, but steady', the main aim being to complete the distance and hills with some sort of composure. It was an autumnal morning, cool and breezy, as I settled into a good rhythm, riding along the dual carriageway west out of the city (as usual, there's no nice way out of the Birmingham), before turning off to ride over Clent Hill (900 feet, according to my Garmin) along a steep, winding country. I heard a buzzard, it's call a 'peee-uu', before seeing the bird overhead. 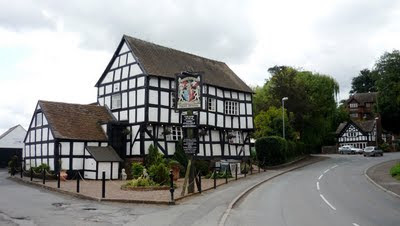 The next 15 miles dropped down to Bewdley, via Hagley and Kidderminster, and the steady headwind wasn't too much of an issue - plus you always feel that you are storing up kinetic energy for the return journey, like coiling a spring. 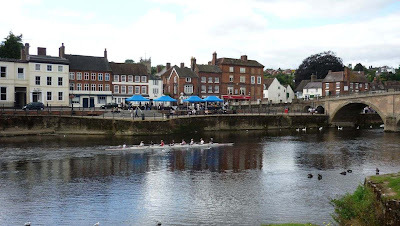 I stopped at Bewdley, a pretty Georgian town which seems rather down at heel, for some chocolate and coke and to watch rowers on the Severn. This is where the country roads properly start. 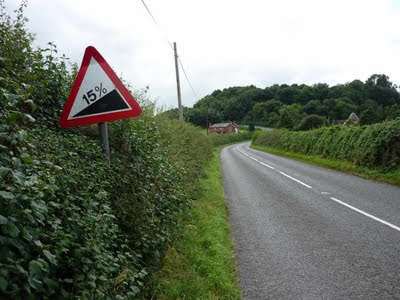 The hill out of Bewdley wasn't as steep as I remembered and it wasn't long before I was up on Callows Hill and then found myself surprised to be cruising up the short, sharp hill at Clows Top. From here the road drops again down to Newnham Bridge and onto Tenbury Wells. It's another pretty market town, where my sister-in-law lives (sadly no time to visit), seemingly full of wonky old half-timbered pubs. This is where I'd added another hill, past Leysters, to my route. It turned out to be a mile-long, 15% brute - making me realise that, even with a compact chain set, I really don't have enough gears. 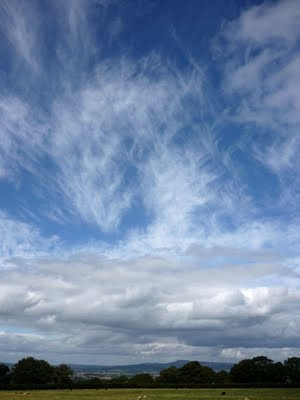 Of course it was then another cruise down into Leominster for lunch (a pasty next to a petrol station, yum!) before turning back. And that's when you feel the benefit of riding out into the wind, storing up good cycling karma - it feels like having the handbrake taken off. The 15mph tailwind pushed me over the first hill easily and I reached the foot of the Clows Top climb feeling fresh. But, after stopping for a snack and drink at Bewdley, I found myself riding back up the 10-mile long uphill section. By no means steep, I could feel my thighs straining and it was becoming increasingly difficult to maintain a consistent pace. By chance my wife, returning from visiting her parents, passed me in the car and pulled over. I must have been showing the strain as she offered me a lift home, but I was determined to finish. And the lat 15 miles, still hilly, but with more flat thrown in, felt great and I made it home on time, after 7 hours in the saddle (+ time for pictures and food breaks). Not a competitive pace, I'll admit, but mission accomplished. However I realised that I would be in no fit state at the end of that ride to tackle Ventoux. So I've made the tough decision to postpone the etape until next Spring, to give time for more mountain training - and also to lose some weight, which should also make a big difference. The other option would be to do the stage over 2 days, but what would be the point or the challenge? A shame, but I think a wise decision - you have to give mountains the respect they deserve. I've Gotta Get Me One Of These! Now this should be in the Olympics! What's the perfect LEJOG Route?